It appears forward J.T. Compher of the U.S. Under-18 National Team Development Program may be sidelined another two weeks with an undisclosed injury. Compher, who has two goals and three points in six games for the USNTDP this season, is projected by many to be the first NTDP player off the board at the 2013 NHL Draft at Prudential Center in Newark, N.J., in June. He was listed as an A skater on NHL Central Scouting's preliminary list of players to watch in the United States Hockey League in September. "There is no timetable [on Compher's return], but his progress has been positive," U.S. Under-18 NTDP coach Don Granato told NHL.com. "I would think, if I'm going to guess, he'll be out two more weeks." Granato isn't exactly sure when Compher was injured. He has missed the team's last five games. "We're not sure if it was in a game or practice, but we think it was a combination of both," Granato said. "Thing is, you can't replace a guy like J.T. He's just a competitive, complete player. He's a great leader for us." In Compher's absence, Granato has received solid performances from first-year player Shane Eiserman and second-year NTDP forward Tyler Kelleher. Eiserman, who had 18 goals and 26 assists in 30 games with Cushing Academy in Massachusetts in 2011-12, currently leads the U-18 NTDP with eight points in 11 games. He has struck for five goals, including one shorthanded. "Eiserman is very competitive, and despite being brand new to the team, has come in and really has had a veteran presence," Granato said. "We returned 21 guys, but Shane has had no trouble walking in and playing a very assertive game and being aggressive. He's very competitive guy … his will is too strong to be denied." 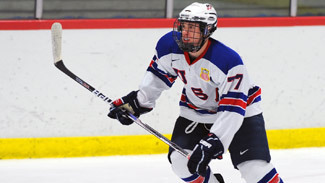 Kelleher, who had 26 goals and 48 points in 55 games with the U-17 NTDP in 2011-12, is first on the team with six goals. He has also connected for a team-leading three power-play goals. "He's a goal scorer," Granato said. "He's got a gift if given any time or space near the net." Granato has also been very pleased with the play to top prospects Hudson Fasching (A skater), Tyler Motte (B skater) and defenseman Will Butcher (B skater). "Those [three] guys have continued to play well [in Compher's absence]," Granato said. "Five of our regular forwards have been out so we're playing with seven guys up front and those three have really kept us in it. Playing against those college teams is not easy when you're depleted and asking guys to do spend more time on the power-play and the penalty-kill. We have five new guys in there who don't know the system, but Fasching, Motte and Butcher have insulted things very well."